Review: 'Sicilian Ghost Story' Is A Haunting, Lyrical and Grim Fairy Tale In this haunting, lyrical Italian film, the true story of a horrific mob-related kidnapping is couched within "a love story [that unfolds] in a fairy tale more Grimm than Disney." 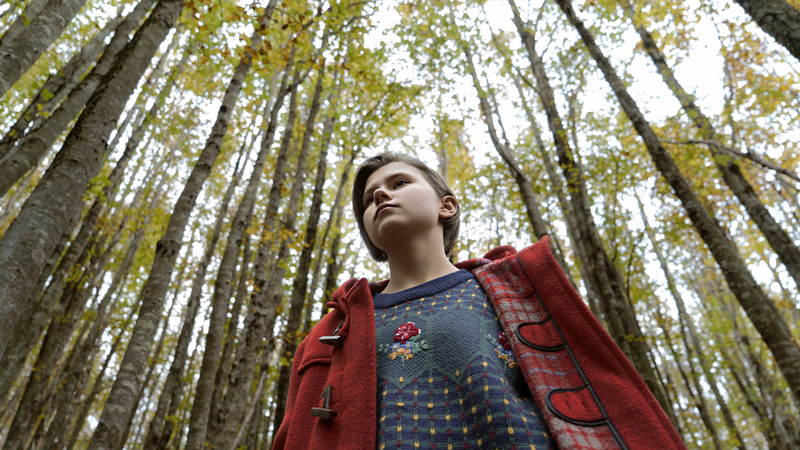 Into the woods and out of the woods and home before dark: Luna (Julia Jedlikowska) strays off the path in Sicilian Ghost Story. In 1993, twelve-year-old Giuseppe di Matteo was kidnapped and held in brutal captivity to put pressure on his father, a Mafia informer, to stop unburdening himself to prosecutors about the Sicilian mob. Sicilian Ghost Story, written and directed by Fabio Grassadonia and Antonio Piazza, wraps a bleakly realist account of young Giuseppe's three-year ordeal into a kind of memorial — by way of a love story, which itself unfolds in a fairy tale more Grimm than Disney. Inspired by a short story about the kidnapping by Marco Mancassola, this intensely atmospheric melodrama opens cheerfully with Giuseppe (Gaetano Fernandez) dawdling along the way to school in his Sicilian village, when he suddenly veers left into dark woods. There, he's soon followed by his classmate Luna (Julia Jedlikowska). Luna carries a letter which Giuseppe snatches and laughingly refuses to give back. The two make a charmingly flirty pair, innocent and trusting and bonded by their love of woodland creatures (expect no tweety-birds here, but there's a baby owl to die for) but both exude a hint of the rebel. The mood is tender and teasing: the letter's a declaration of love; a kiss will come. But first Giuseppe must rescue Luna from a snarling black dog who races in from nowhere, an early portent of savagery to come. The two arrange to meet at the stables where he keeps his horse. Giuseppe doesn't show up there, or in school thereafter. Grownups start making excuses, and Luna falls into a deep funk — but not too deep to prevent her from drafting her sassy best friend, Loredana (Corinne Musallari), to the search for her beau. There's no hope of help from Luna's loving but passive father (Vincenzo Amato) or from her Swiss mother (Sabine Timoteo), a hard-faced disciplinarian with a Mrs. Danvers vibe and an excess of social ambition. From local officials and a police force openly embedded with the Mafia, there's only a thundering silence concerning Giuseppe's whereabouts. Co-directors Grassadonia and Piazza make effectively sparing use of visceral realism to underline the vicious brutality of the mob. But the movie runs the full register of emotion under extremity through a misty lyricism whose landscape — gnarly trees, dripping caves, nocturnal torches flashing out messages of resistance backed by plaintive ambient noise and a mournful soundtrack — evokes the traumatized spirits of those who haunt it. Gliding between Giuseppe's trapped plight and Luna's own imprisonment within her fevered dreams (which involve meeting her lover in the bottomless lake that bridges their separate worlds), the film elides all boundaries between reality and fantasy, between sanity and a madness brought on by grief. Luna, too, is in danger of extinction. As the sense of emergency grows, the story grows an urgent underlying hum of tacit accusation against a Sicily whose older generation has given up the ghost and retreated into passivity or open collusion with the gangsters who terrorize their lives and, worse, their children. There's only one adult who's willing to help Luna find her friend, and she is frozen by sorrow. The question for Luna and Giuseppe is who will save whom, and it is partly answered in the hopefulness of a seaside sequence by the sea. The dead live on in memory; joy returns by way of a ghostly white knight. These rebel kids will be all right.